Your new kitten deserves the best start in life. This means providing everything she needs to grow and stay healthy. Vaccines are an important part of your kitten's health care plan. Basic immunizations are essential to prevent your kitten from getting sick and avoid the spread of disease. When kittens are born, their immune systems are not fully developed and they are unable to fight disease on their own. Fortunately, they are able to get some protection from their mothers. Nursing mothers provide antibody-rich milk called colostrum. These maternal antibodies provide kittens with temporary immunity against illness. The length of this immunity varies from kitten to kitten. Protection from maternal antibodies generally fades somewhere between the ages of eight and 18 weeks. There is no easy way to know exactly when a kitten is vulnerable to a specific disease. In an effort to strategically protect kittens from diseases, veterinarians administer vaccinations at strategic intervals. A vaccine is designed to trigger an immune response and prevent future infection from that disease. All kittens need certain core vaccines, which provide immunity against the most dangerous and widespread diseases. Core vaccines are considered essential for kittens in most geographical locations. Depending on your location and your kitten's environment, certain non-core vaccines may also be recommended. Talk to your veterinarian about your kitten’s risk of exposure to these diseases. Kitten vaccines are usually first given at about six to eight weeks of age and repeated approximately every three weeks until about 16 to 18 weeks of age. Some vaccines might be given together in one injection that is called a combination vaccine. 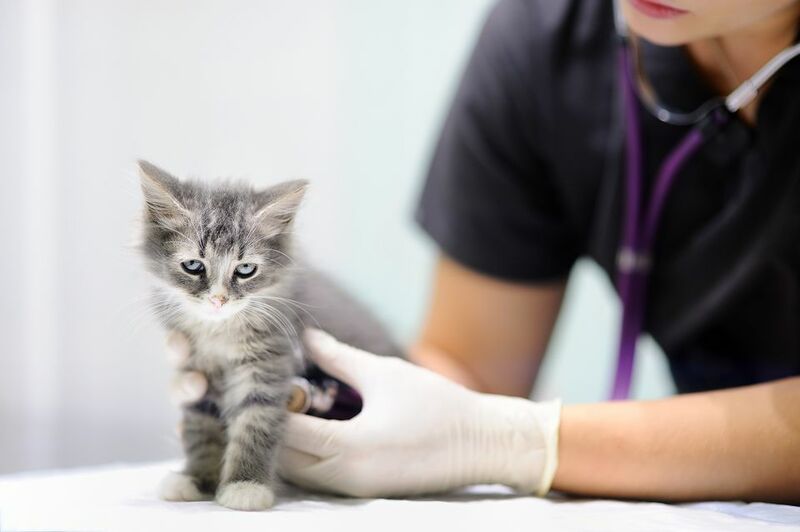 At your kitten's first veterinary exam, your vet will discuss a vaccination schedule as well as other treatments, such as deworming and beginning parasite prevention. The vaccine injection itself is typically not painful. Your kitten may feel a little pinch or sting, but many do not react at all. At the first vaccine visit, your veterinarian will do an examination before vaccinating your kitten. Vaccines should never be given to a kitten with a fever or illness as the vaccine will not be effective. Giving a vaccine to a sick kitten can actually make her feel worse. After a vaccine is administered, immunity is not immediate. It takes about five to 10 days to become effective. However, kittens with remaining maternal antibodies for that disease will not be affected by the vaccine. There is no way to be certain if a kitten still has maternal antibodies, so boosters are necessary. True immunity is uncertain until about 16 to 18 weeks of age, or until all kitten boosters are completed. Avoid exposing your kitten to unknown animals until all vaccinations have been given. Rabies is a fatal virus that can affect cats as well as humans. This is core vaccine that is generally required by law because of how serious this disease is. All kittens and adult cats should be vaccinated against rabies. FVRCP stands for feline viral rhinotracheitis, calicivirus, and panleukopenia. This is a core vaccine considered essential for all kittens. Calicivirus and rhinotracheitis are common feline viruses know to cause upper respiratory infections in cats. Panleukopenia, commonly referred to as feline distemper, is a highly contagious and often fatal disease that attacks rapidly growing and dividing cells like those in the intestines, bone marrow, and the developing fetus. FeLV or feline leukemia virus is a vaccine that is considered non-core in cats. However, it is highly recommended for all kittens. Adult cats who will spend time outdoors should get this vaccine boostered annually. Feline leukemia is one of the most common infectious diseases in cats. It is spread most commonly through bite wounds or via prolonged close contact with infected cats. FeLV can cause a variety of health issues in cats, including cancer and immune system disorders. FIV is feline immunodeficiency virus, a common feline virus spread most commonly by bite wounds. This vaccines is non-core and recommended only for cats at a very high risk of exposure to FIV. Though many FIV positive cats can live normal lives, those adversely affected will suffer from various illnesses due to immune system dysfunction. *Recommendation of non-core vaccines depends on your geographical location and your kitten's environment. Talk to your vet about your kitten's potential exposure. Although there are some risks associated with vaccinations, they are relatively uncommon. Vaccine reactions and side effects are typically minor and often go away on their own. These may include pain and swelling at the injection site, lethargy, or a mild fever. Severe allergic reactions are less common but can be fatal if left untreated. If your kitten develops hives, facial swelling, or difficulty breathing, go to the nearest open vet immediately. Because vaccinations stimulate the immune system, there is a slight risk of developing an auto-immune disorder. This is extremely uncommon when you consider the numbers of pets affected versus all the pets that are vaccinated. However, auto-immune disorders can be serious and difficult to treat. Illnesses that may occur include blood disorders, neuromuscular issues, and even skin problems. Most veterinarians and pet experts agree that the benefits outweigh the risks when it comes to vaccines, especially for young animals. When it comes to adult boosters, many vets are embracing protocols that vaccinate less often. Once given annually, many adult vaccinations are now more likely to be recommended every three years.